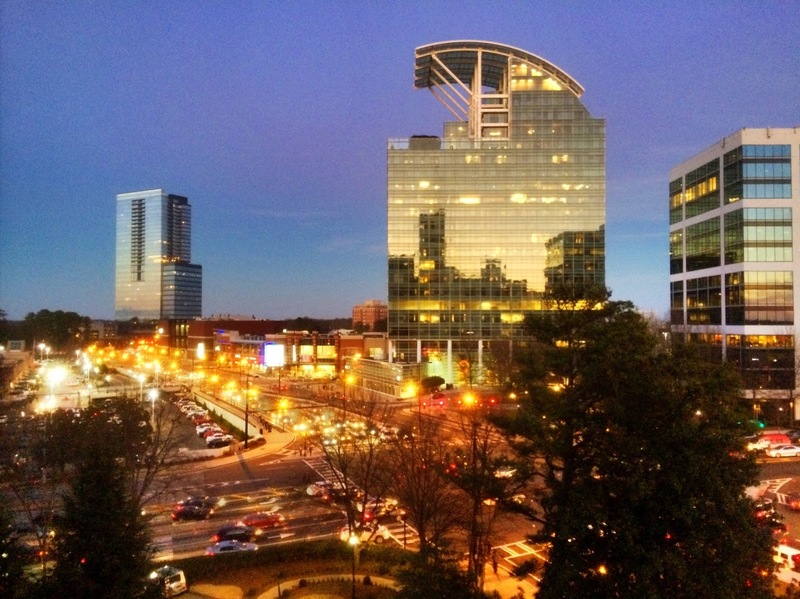 We took an early Valentine's Day getaway last weekend to Atlanta. 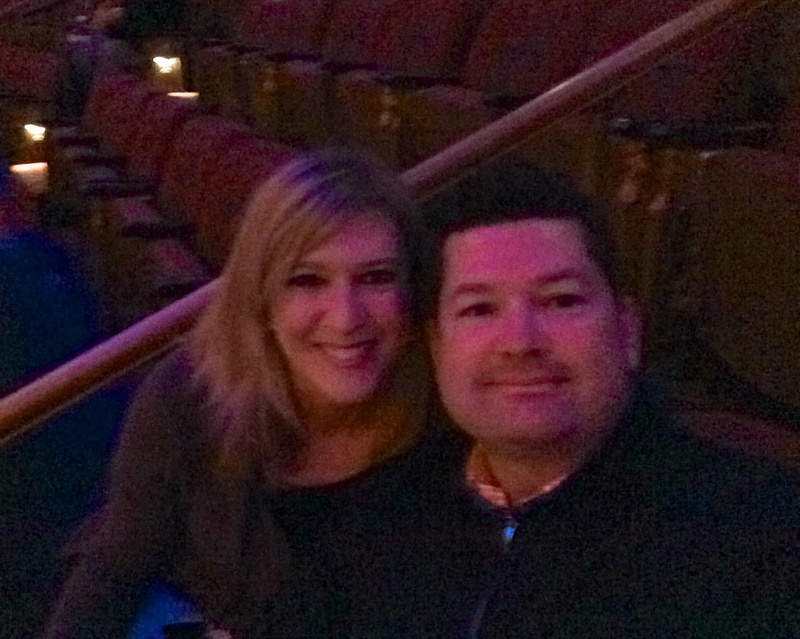 We had tickets to see Book of Mormon on Sunday, so we decided to made a weekend of it! 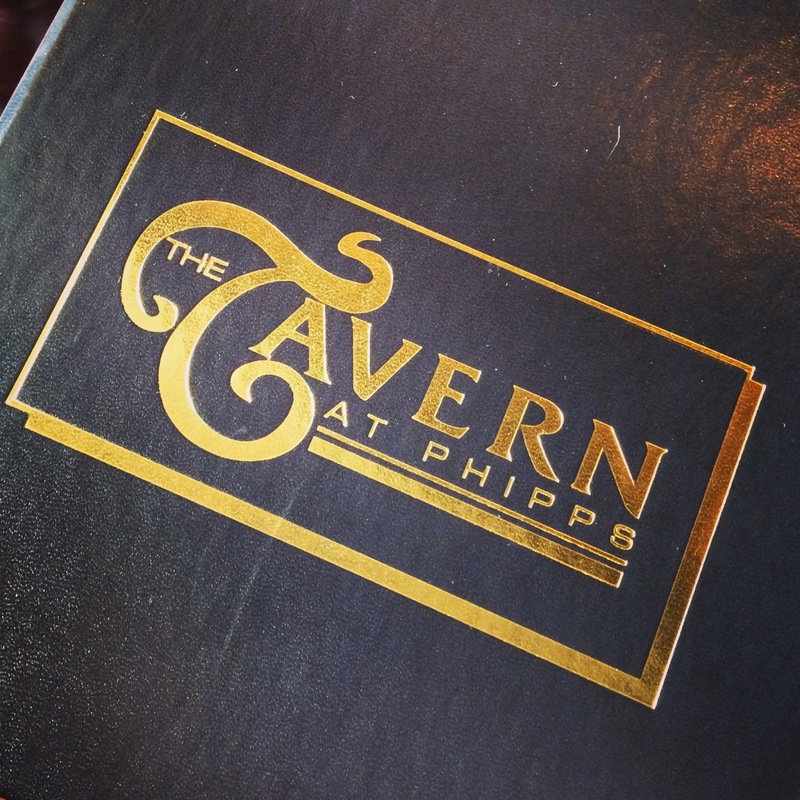 Our first stop at The Tavern at Phipps. We met my cousin and his fiancee for lunch. We haven't seen them in forever. It was great to catch up. 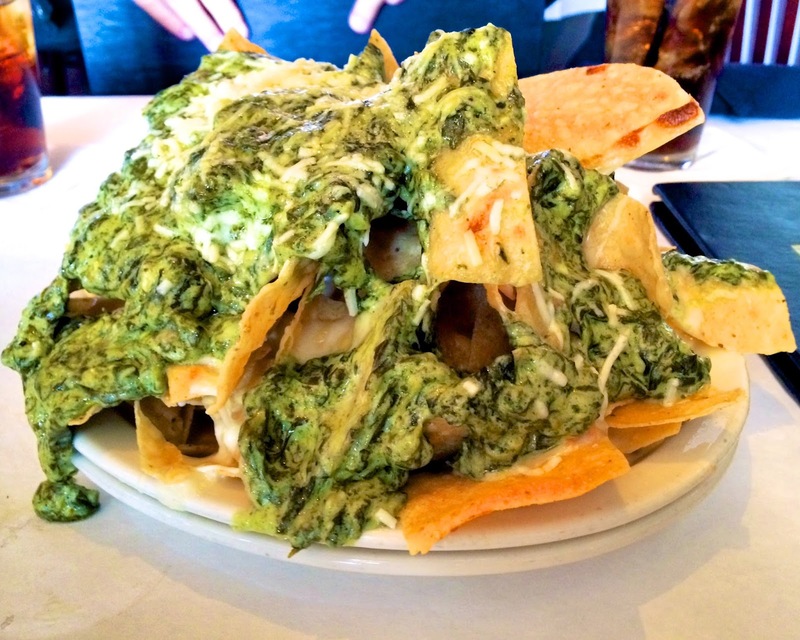 We started with the Spinach Chips. They are amazing! I could eat this as my meal. 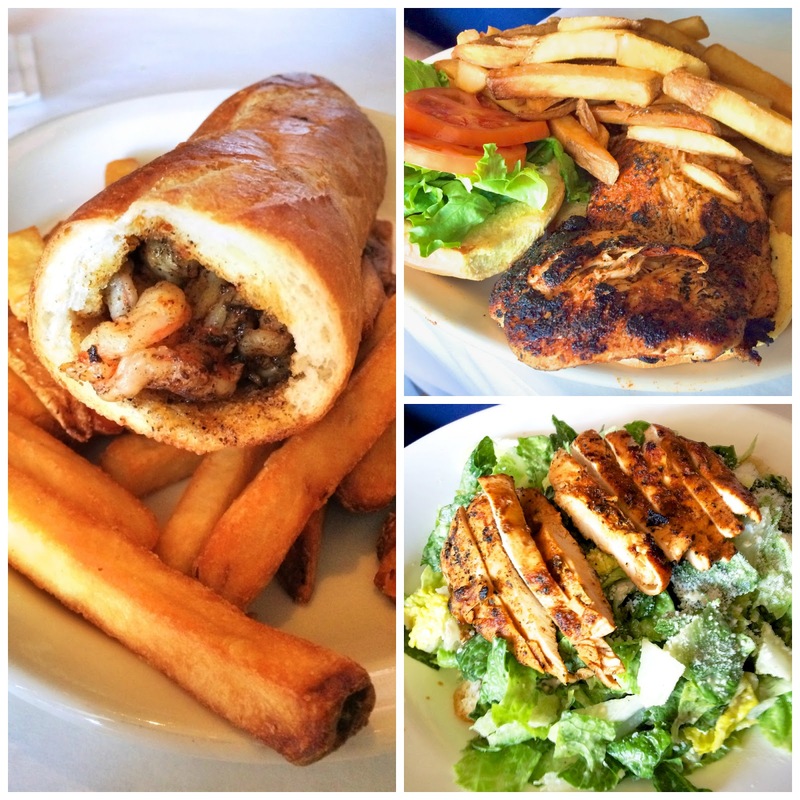 We got the Spicy Shrimp Baguette, Broiled Chicken Sandwich and a couple of Chicken Caesar Salads. Chicken Legs and I both got our chicken blackened. YUM! After doing a little shopping, it was finally time to check into the hotel. 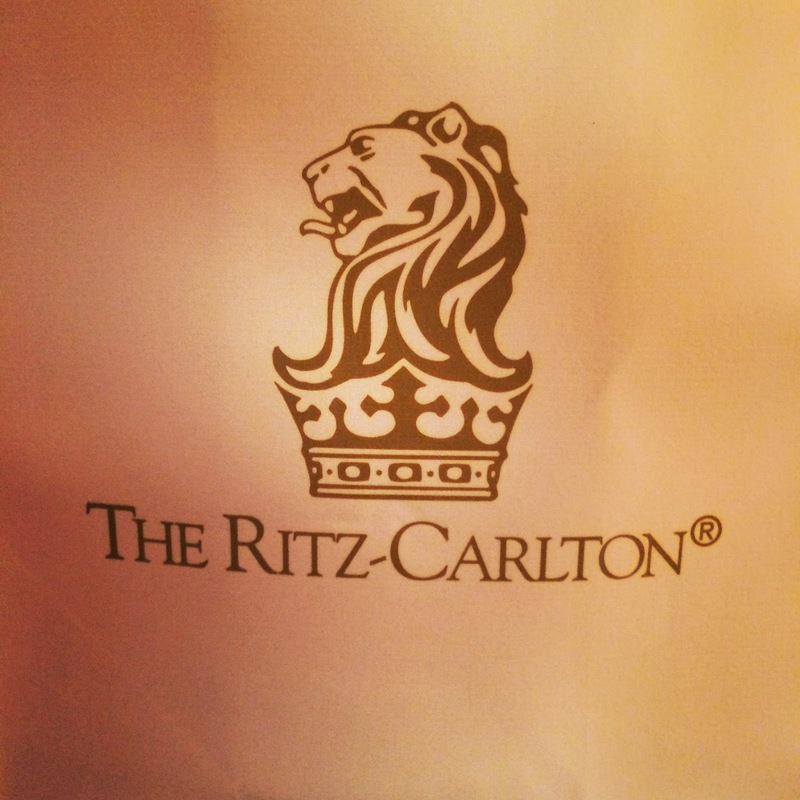 We stayed at The Ritz Carlton in Buckhead. It is one of our favorite hotels! The hotel staff is amazing - very accommodating and extremely attentive. Our room had a great view! We got cleaned up and had a cocktail in the lobby bar. It was packed! Lots of great people watching. They also had some good live music. We had the hotel drive us to dinner. 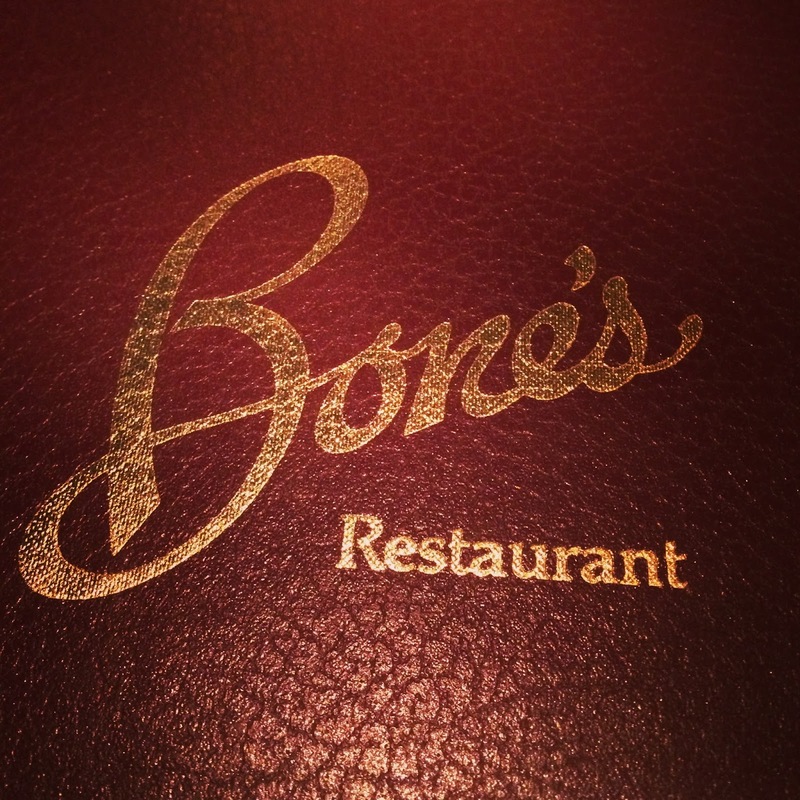 We went to Chicken Legs' favorite place, Bone's. 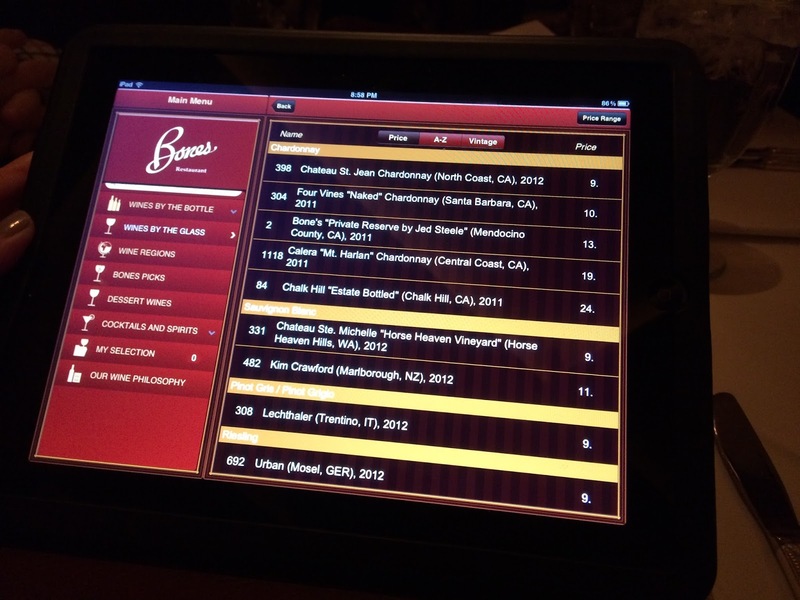 I love that their wine and cocktail list is on an iPad. So cool! We started with the Grit Fritters. 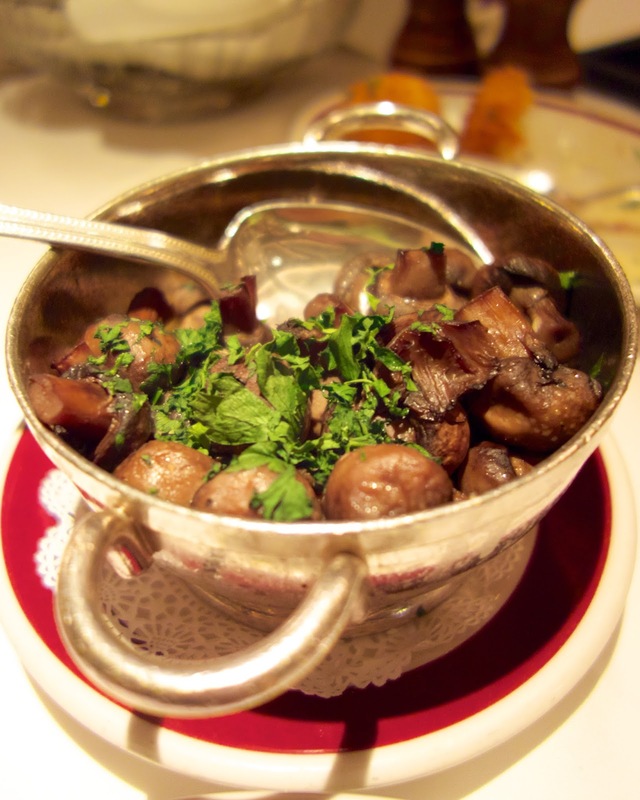 They are a side dish, but we like to eat them as an appetizer. They have boursin cheese mixed in with the grits. 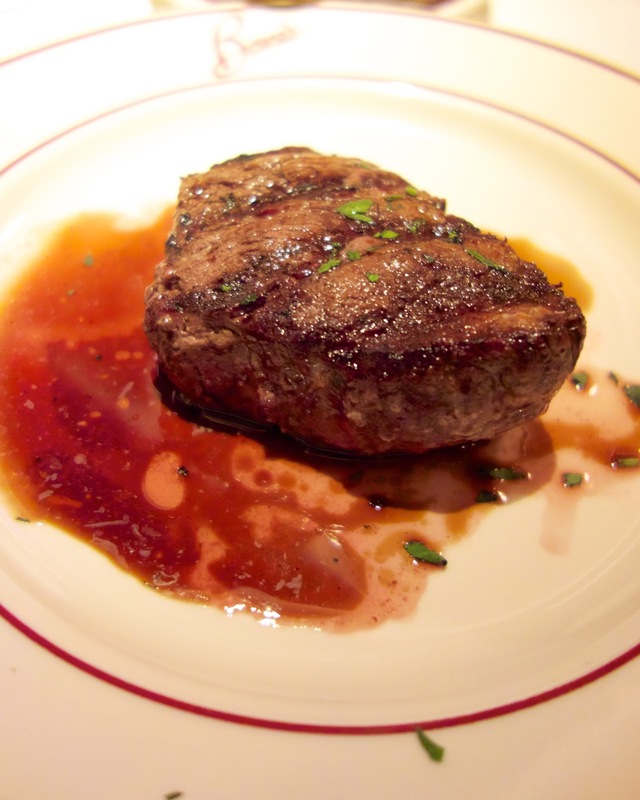 I got the 8 oz filet. It was cooked perfectly (Medium Rare Plus). Chicken Legs got the Mixed Grill. It had lamb, pheasant sausage and filet. He loved it; especially the lamb! 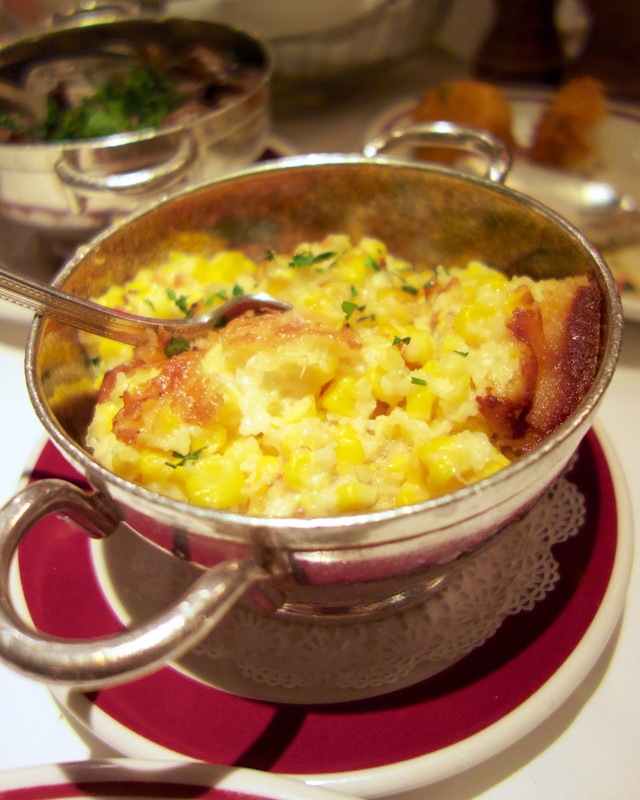 For our sides, I got the corn pudding. Chicken Legs got the mushrooms. We didn't have any room for dessert, so we went back to the hotel for a nightcap. 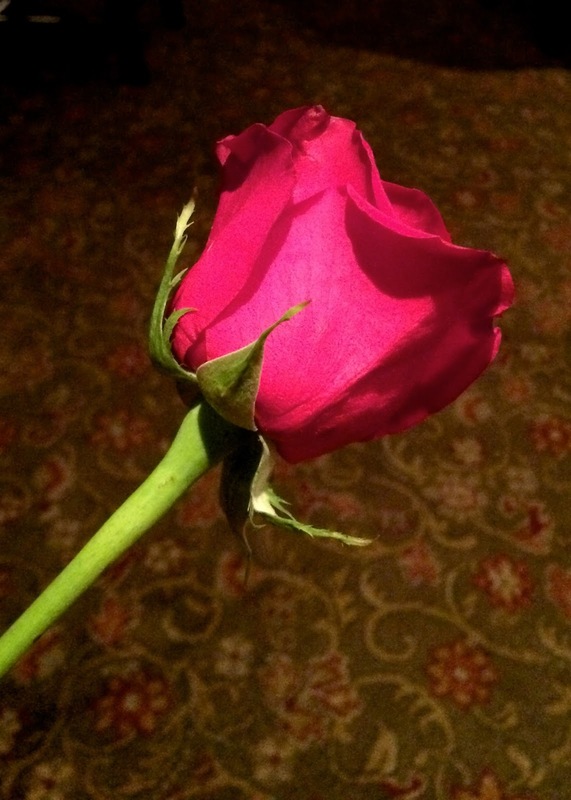 Our driver gave me a rose on the ride back to the hotel. Our room rate included breakfast. OMG! What a great buffet! They have fresh waffles, an omelet bar, potatoes, eggs, eggs benedict, sausage, bacon, fruit, cereal, oatmeal, pastries, biscuits, sausage gravy, and cheese grits. The cheese grits are SO good! 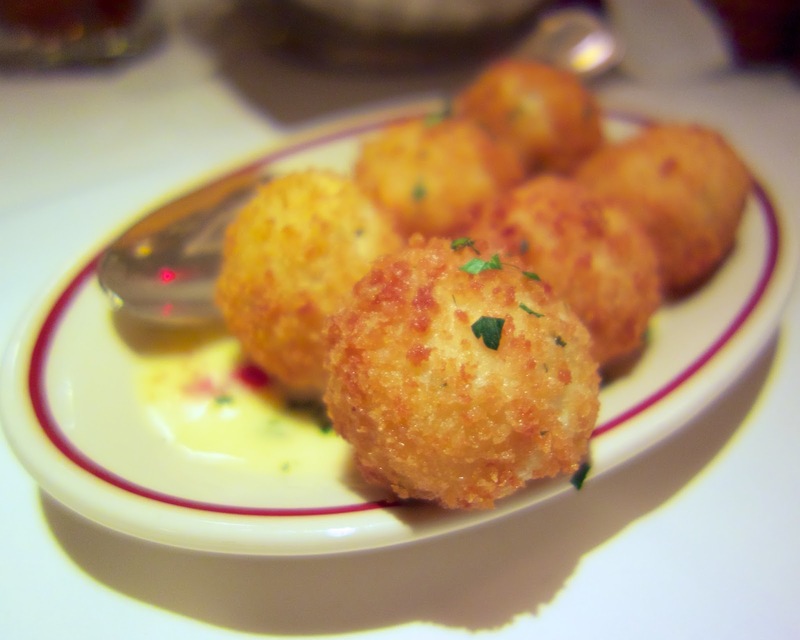 They are mostly cheese with a little bit of grits. YUM! 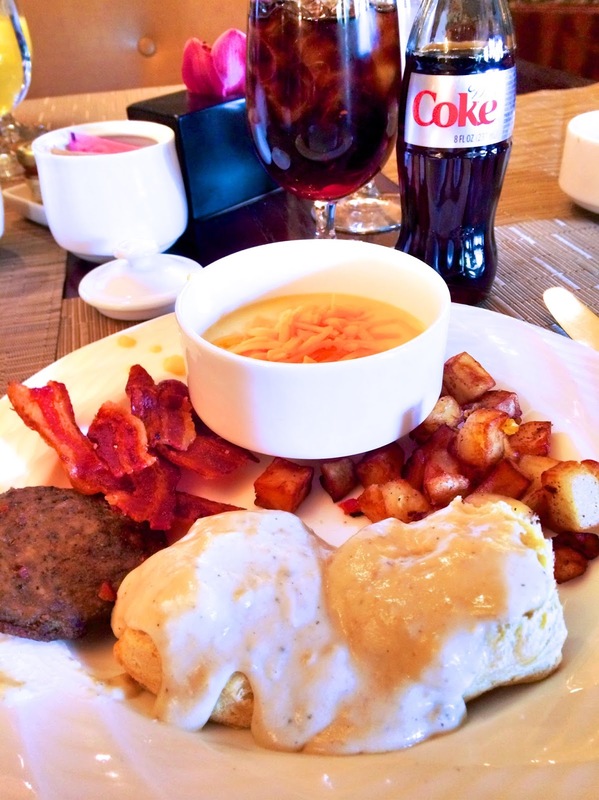 I also really love the sausage gravy. I need the recipe ASAP! After breakfast it was time to head to Midtown for the play. 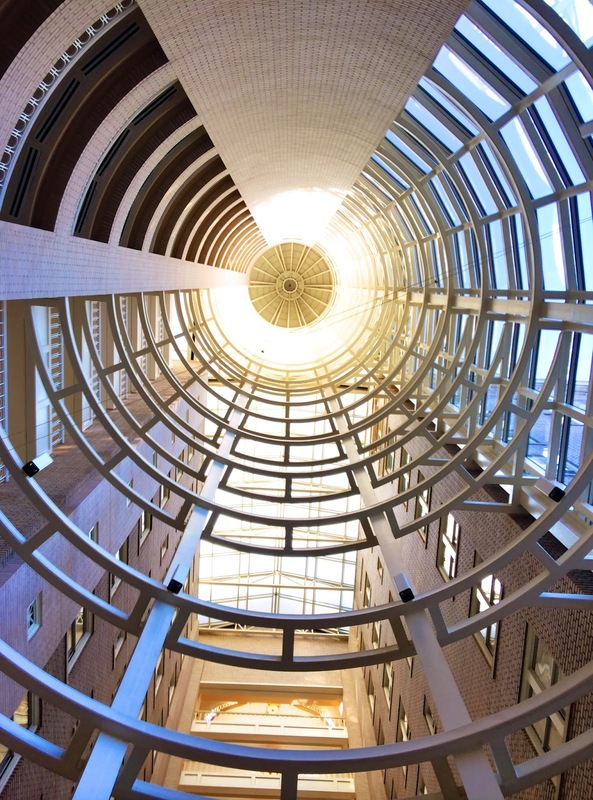 We got to Midtown early, so we checked out the lobby of the Georgian Terrace Hotel. It was really nice. I especially loved the view looking straight up. We might need to stay here next time. While we were there, Chicken Legs spotted some people from one of his favorite shows, the Barrett-Jackson car auction. Tom "Spanky" and Amy Assiter. 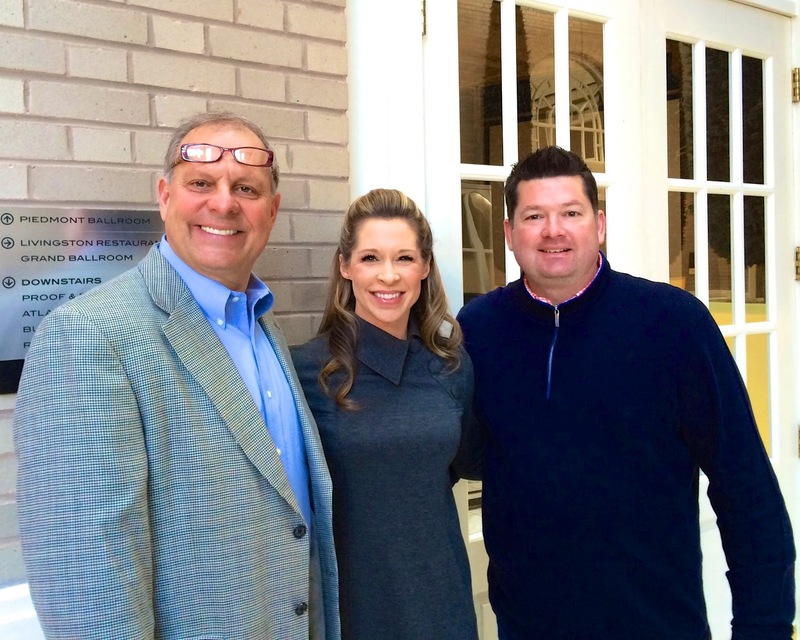 Spanky is an auctioneer and Amy is a bidders assistant. They were incredibly nice and talked to us for a long time. Chicken Legs got to ask them about the auctions and their favorite cars. It was finally time to head over to The Fox. We were there for the opening of the doors. 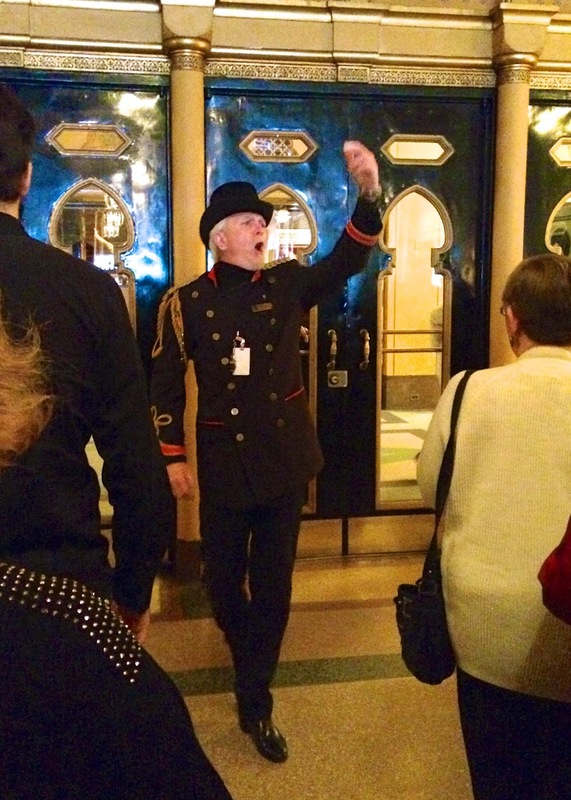 This gentleman puts on a great show for the opening! 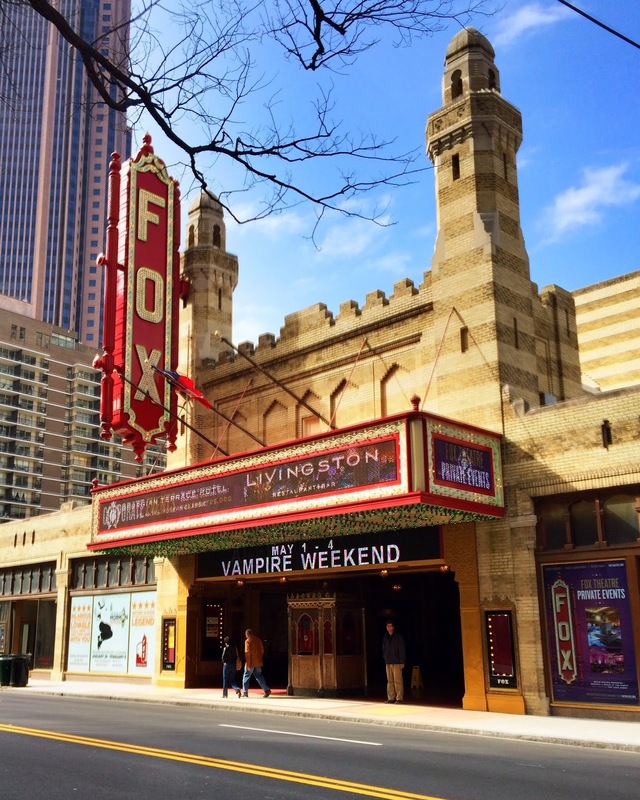 "Welcome to The Fabulous Fox Theater!" 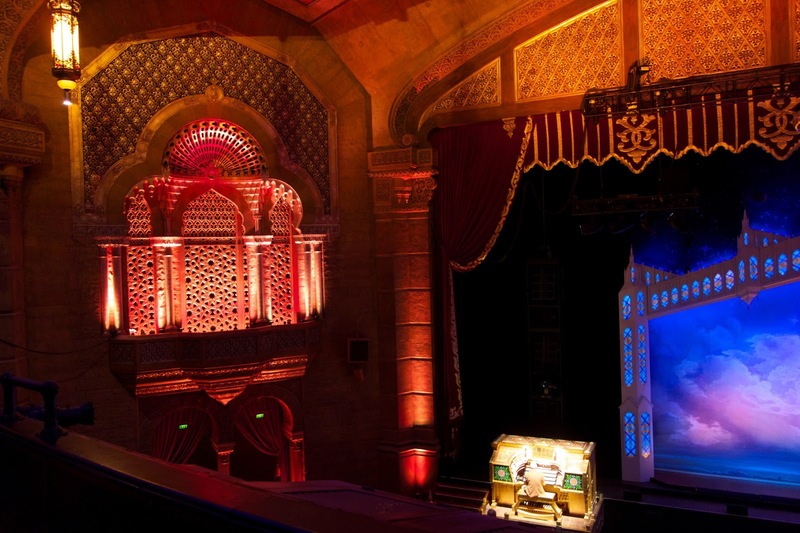 Before the show, The Fox has an organist play. 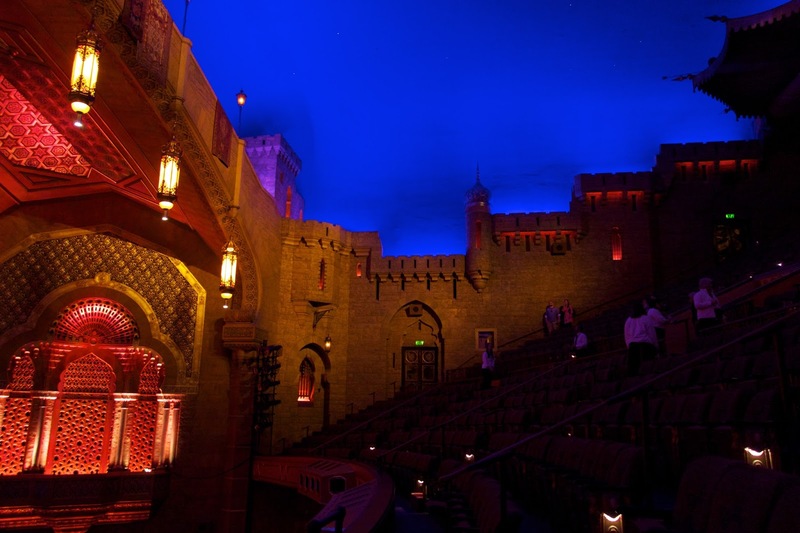 The Fox is one of my favorite theaters. It has a Moroccan vibe. I love the star design in the ceiling. This was the second time we have seen Book of Mormon. We saw it on Broadway at the end of 2012. 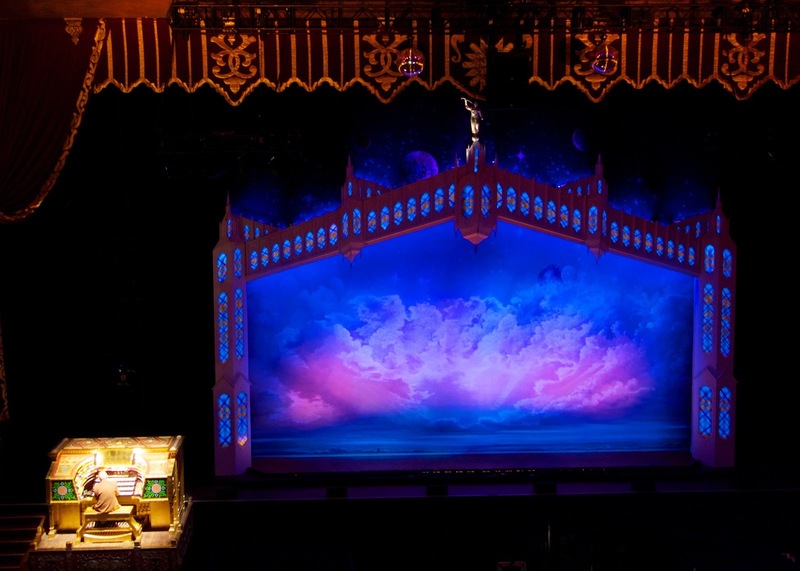 The national tour of Book of Mormon was just as good as we remembered. We had a fabulous early Valentine's Day! How was your Valentine's Day? Did you take a trip? Stay at home and cook? 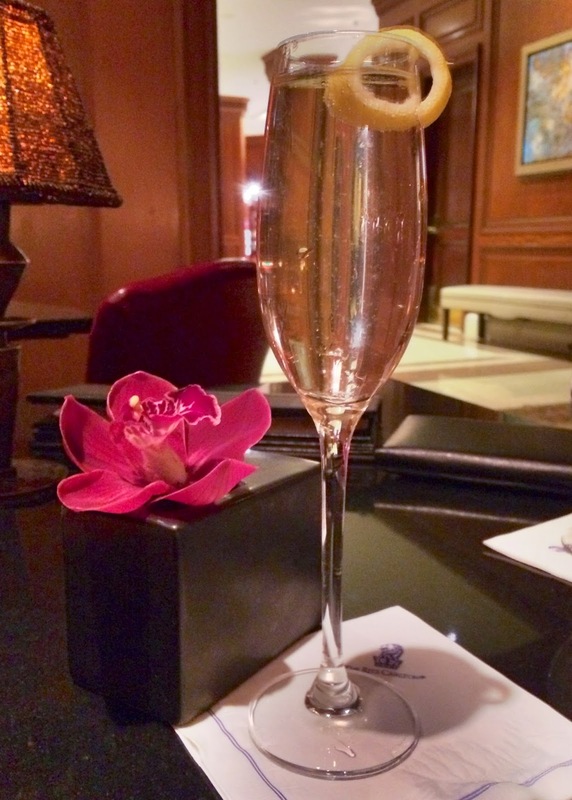 The night my husband and I were married, we spent at the Ritz Carlton 28 years ago:) It is awesome! Looks like you guys had a wonderful weekend! Have a blessed day, HUGS! We live about 40 miles north of Atlanta. Have not been downtown in years. Have passed through going places but that is all. I did cook last night and our 2 year old great granddaughter was my husband's dinner date. She sat at the dining table all by herself and I fixed their plates. She was so cute sitting in that big chair. She had a chocolate dipped strawberry that I had fixed for my husband. I had them under a glass dome and she got so excited when she saw them. So cute!!! So glad you had a nice early Valentine's weekend. 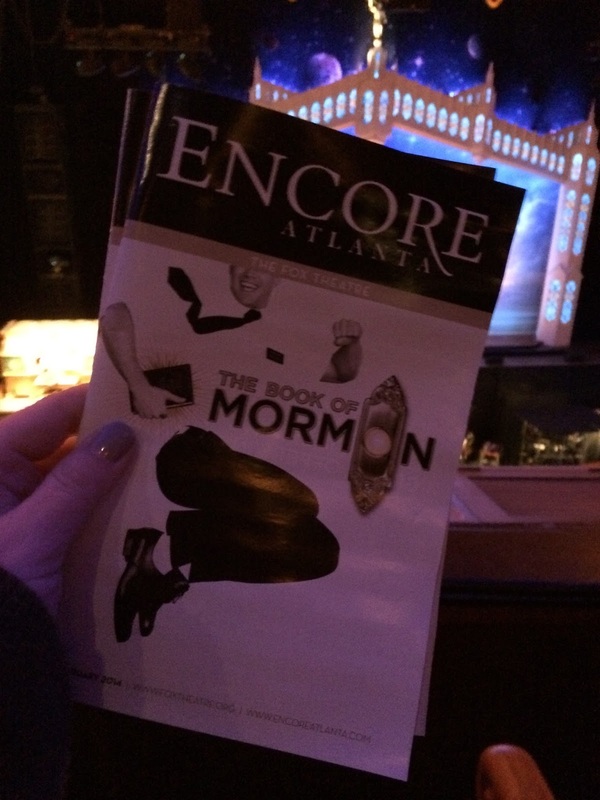 I live in Atlanta and also saw the Book of Mormon at the Fox (we have season tickets) - it was very funny! 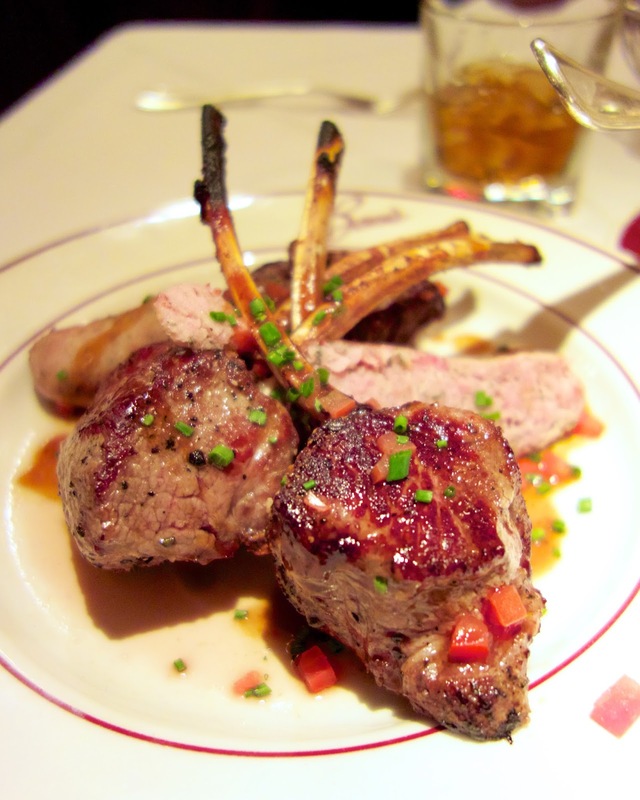 You picked some great restaurants while you were in town. The next time you are in Atlanta, you must go to Agave. It is my favorite restaurant in town. Sounds like you had a wonderful time!!! 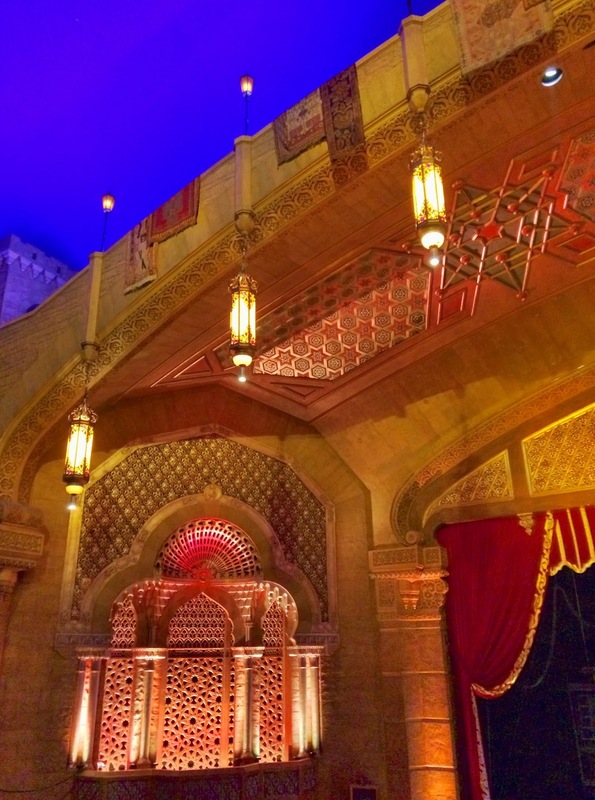 The Hotels and theater are gorgeous!! Always enjoy seeing your trips. Thanks for sharing.